a modern facility through numerous fundraising efforts as well as utilizing donated/discounted materials and skilled labor provided through a variety of sources. time they visit the museum. ​it is encouraged to contact the museum prior to your visit to ensure our facility will be open. We look forward to seeing you at the museum and sharing the rich history of the Islip Town volunteer fire and EMS service! As a private, non-profit museum, we operate entirely without any taxpayer funding. Help Keep our History ALive! 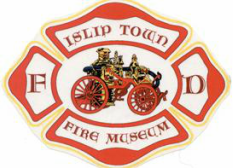 There are many ways you can help the Islip Town Firefighters Museum. 100% of your donation will go to the development and preservation of historical items. We are currently looking for volunteers to help us maintain and conduct tours on weekends. If you shop on Amazon you can help us raise funds by making us your benefiting charity. Shop as you normally would and we will receive 0.5% of the purchase! Please join our email list for important updates, newsletters and other important information. ​Your email address will never be shared, sold or used by anyone other than museum personnel.